Do you have an urgency to address issues of social justice, discrimination, immigration or globalization? We encourage you to consider pursuing a degree in Ethnic Studies. The Ethnic Studies Program at Saint Mary's College of California takes a critical multidisciplinary approach to addressing issues of power, privilege, and resistance through critical thinking, applied theory, activism, and social justice praxis. Ethnic Studies students engage dynamic comparative multiracial and multiethnic perspectives. The program employs an intersectional theoretical lens to examine race, ethnicity, gender, class, sexuality, legal status, Indigenous nationhood, and other dimensions of identity and lived experience. Through course work, research, and community engagement, Ethnic Studies students explore constructions of race, ethnicity, and community within the U.S. and beyond, with particular attention paid to African American, Asian American, Latinx, Native American, and Pacific Islander communities. 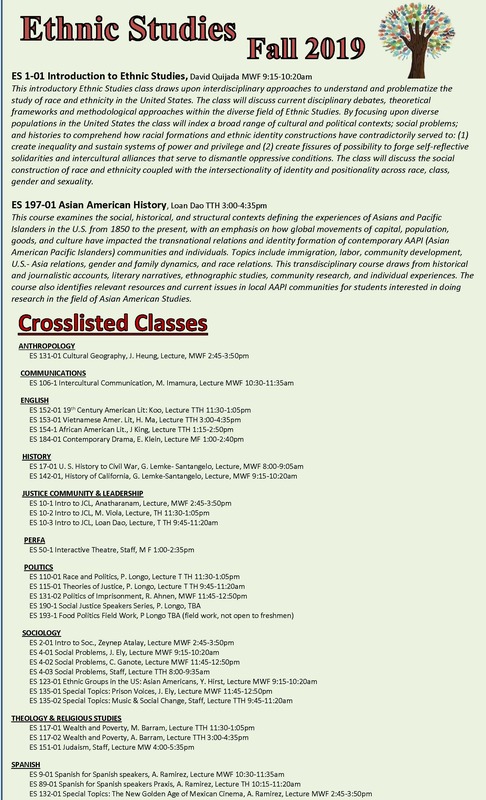 The Ethnic Studies approach to teaching and learning engages many academic fields, including: anthropology, the arts, communication, disability studies, economics, history, politics, psychology, queer studies, sociology, theology and religious studies, and women & gender studies. Ethnic Studies students examine issues of social justice, colonialism, discrimination, immigration, and globalization as well as the social, political, and cultural contributions historically marginalized groups have made to society. Ethnic Studies embodies the College’s Lasallian commitment to social justice, respect for all persons, and the fostering of an inclusive community.